This week we’re discussing some of the activities we just couldn’t do without at Oshogatsu: omikuji, or New Year’s fortune telling, and hanetsuki, which is similar to badminton. Read on to find out why these activities are two of our favorite things about the Japanese New Year. Omikuji literally means “sacred lot” and is usually done at Shinto Shrines and Buddhist temples in Japan on New Year’s Day. Attendees make an offering (in Japan usually a 100 yen coin, but it’ll be $1 at the festival) and receive a fortune or blessing. Below this category you would find the actual fortune as it relates to your life. Some of the traditional fortunes deal with wishes or desires, lost articles, travel, business dealings, romantic relationships, marriage proposals , engagements, and other topics. At Oshogatsu you’ll make your $1 offering and draw a number. This number corresponds to a fortune, which our staff will give you. Bad fortunes are tied to trees or wires so that they don’t attach themselves to you. If your fortune is good you can either take it with you for good luck, or tie it to the wire to give it greater effect. Hanetsuki is a game similar to badminton, but without a net, that was traditionally played by girls around New Year’s. You can play as a pair, or by yourself, but the object is to keep the brightly colored shuttlecock aloft as long as possible. The game is played with decorative paddles called hagoita, and while the game no longer enjoys the popularity it once did, hagoita are still very popular collectors items. In December of each year Sensoji Temple holds a huge market devoted to the paddles. More traditional decorations on the hagoita usually depict beautiful Edo-period ladies or kabuki actors, while modern images include fantasy characters (like Hello Kitty or Harry Potter), celebrities, sports players and even politicians like Prime Minister Koizumi. At Oshogatsu you can enjoy hanetsuki on the hill top near the Shishimai Stage and hear the sound of rousing taiko drums or beautiful koto while you play! If you need something to tide you over until the big day head over to our New Year’s in Japan Pinterest board and see what’s in store, or take a peek below! See you next weekend! With Bon Festival just under four (!) weeks away, we’re highlighting what’s new this year, beginning with our favorite addition to the Obon repertoire – our Social Media Lantern. Each year at Bon Festival, Morikami staff handcrafts close to 1,000 paper lanterns, inscribed with messages from our visitors to loved ones who have passed away. 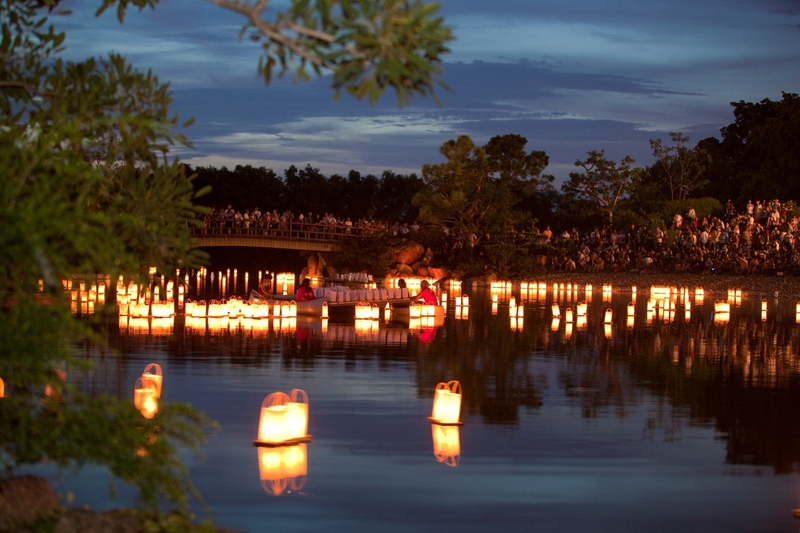 At the end of the night, each lantern, lit by a single candle, is released into Morikami Lake as part of tōrō nagashi: literally, lantern floating. These lanterns are meant to guide visiting spirits, who have returned during Obon for a brief visit to the living, back to the otherworld. Last year 9,000 guests at Bon Festival watched hundreds of lanterns cover Morikami Lake in glowing, floating rectangles. Hundreds caught them on film, and dozens shared these photos with our online community on Facebook and Twitter, more than 20,000 strong and growing. We reach fans throughout the US, but our second largest Facebook audience tunes in today from Colombia, then the UK, Canada, Japan, Spain, Peru, and so on. Short of hopping on a plane to join us next month, how can our most faraway fans experience the magic of Obon too? Enter our Social Media Lantern. We’re asking you, our online community, to share messages to loved ones lost to complete the lantern we’ll display at this year’s Bon Festival (and of which we’ll share photos afterwards – via social media, of course). Submit your message on Facebook through our Social Media Lantern button or on Twitter with #mylantern. Joining us but want to share your message anyway? Please do; our first ever Social Media Lantern connects our entire online community. The Morikami’s staff curated the exhibition Zenmi –A Taste of Zen: Paintings, Calligraphy and Ceramics from the Collection of Riva Lee Asbell, which opens October 18th. Curator of Collections, Veljko Dujin, collector Riva Asbell and I began to plan and research educational programs to accompany the exhibit one year ago. We will welcome two Zen masters to Morikami who have agreed to come from Japan. Shōdō Harada Rōshi is a highly-respected Zen teacher and well-known calligrapher. He will travel from Sogen-ji Zen Monastery in Okayama, Japan where he is the abbot. 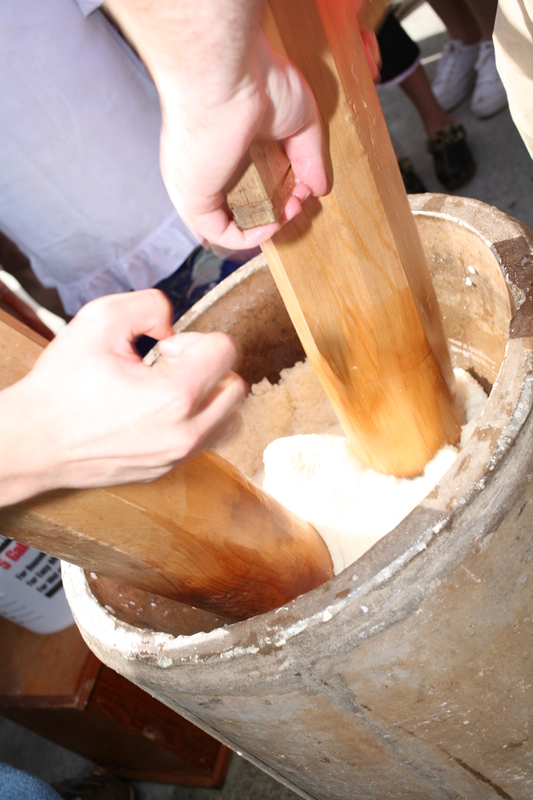 Ms. Asbell has included one of Harada Rōshi’s scrolls in the exhibition. The scroll reads Sōgen no Ittekisui (One Drop of Sōgenji’s Water). The same kanji represents the name of Harada Rōshi monastery and the scroll’s Sōgen. Water, drop by drop, gathered together makes a large river; one drop has many possibilities, and each of us can make a difference, too. Harada Rōshi frequently travels abroad and often guides meditation sessions at the One Drop Monastery in the state of Washington. His teachings have begun to spread throughout the United States. Harada Rōshi will hold two calligraphy demonstration programs Tuesday, October 25 in Morikami’s Seishin-an tea house. Seishin-an offers an intimate setting for these demonstrations, so seating is limited. This demonstration will be the first of its kind by a Zen master in South Florida. On Friday, November 18th, Morikami will welcome Professor Jeff Shore. Professor Shore teaches at Hanazono University in Kyoto, Japan. He has studied and practiced Zen Buddhism for almost 40 years. His master since 1982, Fukushima Keidō, passed away on March 1 while Professor Shore was teaching in Europe. The Zenmi catalog is dedicated to Fukushima Keidō, and you will find his calligraphy in the exhibition. I particularly like one piece that reads Hōgejyaku (Throw it away). The word Hōgejyakuteaches me, if one throws everything away, one will find his or her own ground. Don’t so many of us want many things, already have so much, and still fail to see what really matters? Professor Shore conducts Zen retreats throughout Europe. He recently came back to Japan from a month of teaching there. Professor Shore will likely lead his discussion “Living Zen” zazen-style in our theater: seated, rather than standing, on the stage. We recommend interested individuals register and purchase tickets for these events as early as possible, as spaces are limited. Personally, I am excited to see the calligraphy demonstration and to hear more about Zen. I also look forward to viewing the Zenmiexhibition as well as each Zen master’s unique brush strokes, and to learn their understanding of these words. Before I came to America, I lived in Uji City, southern Kyoto Prefecture. Uji is famous for its fine tea production. On my way to and from school I could see undulating tea bushes stretch over the hillsides. The smell of fresh tea drifted from the tea shops alongside of Byodo-in Temple Street. Japanese tea became ever more popular with the vast development of Japanese Sushi restaurants in America. People drink Japanese tea as a health drink because it contains catechin, a natural antioxidant. There is a tea plantation in Charleston, South Carolina where one can observe tea production. I visited four years ago and learned that black tea, Japanese tea and Oolong tea are all produced from the same tea plant, but the difference between the three comes from their oxidation process (or lack thereof, in the case of green tea). I have seen tea bushes in Japan and South Carolina, but I never saw tea flowers until recently (pictured here). 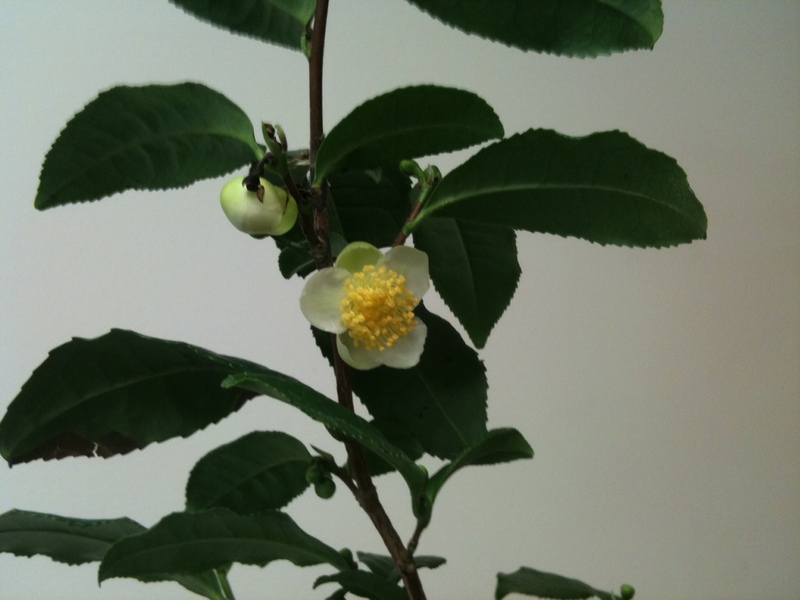 A Morikami education staff member purchased a tea plant from a tea-themed exhibition at the Donna Klein Jewish Academy. For 14 years, we have run a joint program with the Academy to teach fourth graders about Japanese culture. As you could guess, it is too hot in South Florida to grow tea plants. So, our staff member kept her tea plant in a indoor pot after the exhibition. One day, I found the small white and yellow stamens open. We all gazed at it curiously; the next day, a second flower emerged. I had never seen tea plant flowers because Japanese tea farmers picked them, believing the flowers take nutrients away from the rest of the plant. 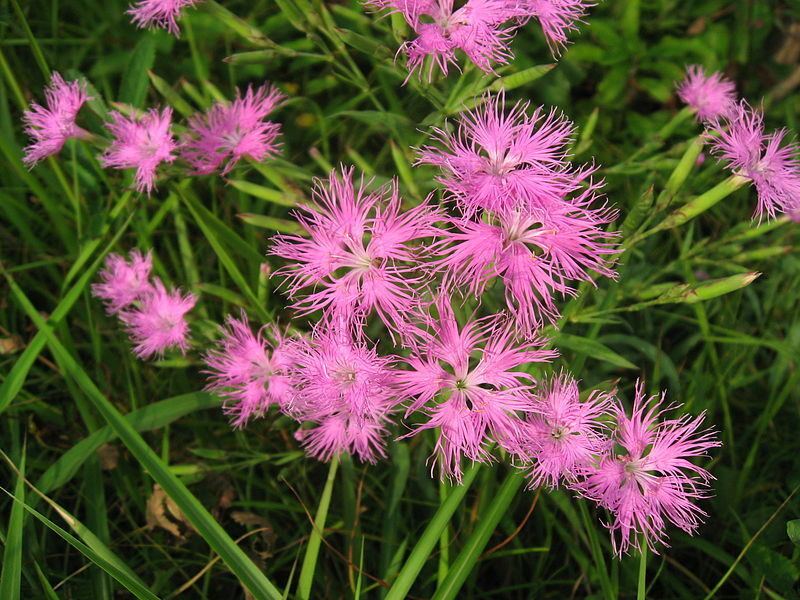 In Japan, tea is not made from these flowers. However, I read that the Chinese have used tea flowers since ancient times. There is Chrysanthemum tea, Jasmine tea, and Rose tea; therefore, tea flower tea must be drinkable, right? If you have ever tasted a tea flower drink, let me know. I am curious about its taste. 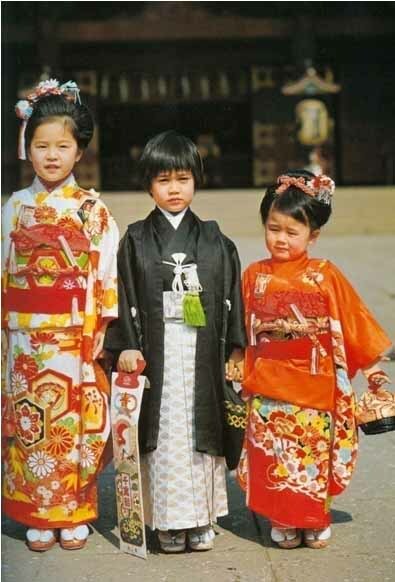 On October 1st, Japanese people traditionally change their summer wardrobe to warmer clothes. Even though the weather still may be warm, students change into long-sleeved shirts and jackets, and business men change to darker colored suits of heavier materials. In Japan, this is called koromogae, a sign of fall. Also, in early fall, the Japanese celebrate a special day. This year, this national holiday falls on Monday, October 11th. Do you know what the Japanese are celebrating? The day commemorates the first Olympic Games held in Japan. The original holiday date was October 10th. Every Japanese school, and sometimes companies, hold a special event called undōkai (sports meeting) around October 10th. Hopefully, you guessed correctly! October’s Japanese national holiday is Taiiku no Hi which means National Sports Day. The Japanese government promotes national health and wellness, and supports athletic activities. Many competitive sporting events are held in Japan to commemorate the day. Do you know any other country that has an athletic day which is a national holiday?